Foodspiration: Friday Nights at the Dog Park . . . I've previously mentioned that Friday night is wine night at the dog park (exact location kept secret unless you really want to come and then just email me . . . our numbers seem to be growing all of the time). This week I want to celebrate the ingenuity of our friend Bob who constructed this suspended platform from a piece of wood, a bit of rope, and some carabiners. 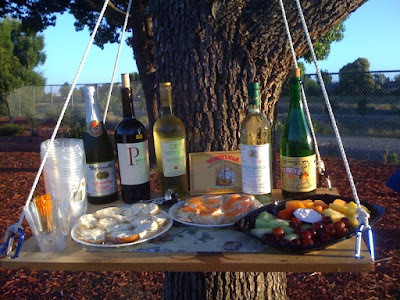 This certainly has been an evolution from hiding our bottles in bags behind the tree, to a small and collapsible metal table, to what you see today. Very portable and keeps the goodies at human height to prevent any of our well-behaved dogs from being tempted. Also, thanks to our neighbor Chis for snapping this photo just before we arrived to share our contribution . . .
That is so cool! It looks really nice, and could be useful for so many different occasions! I'm going to remember it. BTW, Dog night at the park sounds really fun too! ( : Thanks for sharing! as a fellow "dog park" owner, I can only say I love my friends and neighbors. I'm so blessed to have you! My mom has wine night at the dog park too (in Piedmont), but I don't think they have the fancy shelf. They probably need one!